Endoscopic cystocisternotomy is one of three surgical methods used to treat middle cranial fossa arachnoid cysts. There is debate about which method is the best. 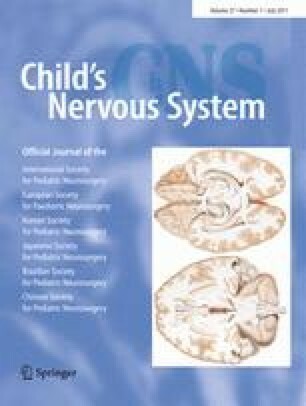 The aim of this study is to evaluate the effectiveness and safety of endoscopic cystocisternotomy for treatment of arachnoid cysts of the middle cranial fossa. Thirty-two patients with arachnoid cysts of the middle cranial fossa who had undergone endoscopic cystocisternal fenestration between 2004 and 2009 were studied retrospectively. Data were obtained on clinical and neuroradiological presentation, indications to treat, surgical technique, complications, and the results of clinical and neuroradiological follow-up. Among the 27 patients with symptoms before surgery, 8 had disappearance of symptoms and 17 had improvement of symptoms. The cyst was reduced in size or it completely disappeared in 24 (75%) patients. The incidence rate of complications was 18.8%. Endoscopic cystocisternal fenestration is an effective treatment for symptomatic arachnoid cysts of the middle cranial fossa and should be the initial surgical procedure.